VOGONS • View topic - What retro activity did you get up to today? Re: What retro activity did you get up to today? Faraday cages (including electronics enclosures) are typically grounded. That's all I meant. gdjacobs wrote: Faraday cages (including electronics enclosures) are typically grounded. That's all I meant. I recommend mu-metal https://en.wikipedia.org/wiki/Mu-metal if you want to protect something from a magnetic field. I use shields made of this with photomultipliers. It doesn't need to be grounded unless you want it to also act as a Faraday cage. feipoa wrote: I just put together a testbed with an AMD slot A Athlon 1 GHz and a Radeon 8500. Thunderbird or Orion? I have both (the Orion won't reach me for a while), but no slot A board yet. Wait... there was a slot A variant of the Thunderbird core? Is it more or less rare than the Orion core? Are there any benchmarks available at 1 GHz between Orion vs. Thunderbird on the same system? The one I am going to test is the AMD-K7100MNR53B A, which I think is from the Orion core. Although AMD didn't release faster modifications of slot A Athlons, they did update their slot A line with the new core. Distinguishing Thunderbird Athlon processors from earlier modifications is easy - they use different naming conventions. From my understand the Orion versions are AMD-K7100M... while the Thunderbird versions are AMD-A1000M... Makes me wonder if a BIOS update is needed. Reminds me of slot 1 Katmai vs. Coppermine. Yes, that is the Orion. The Thunderbird is A1000MMR24B A. They both cost me $100. I'll be testing them before the slower models when I get a motherboard and receive the Orion. Swapped out the IWILL SIDE VLB controller in my Compudyne 486 build with a Kouwell KW-560D VLB controller. Boots up way faster because it doesn't have to go through the onboard BIOS of the card and seems to work better with the IDE to CF adapters as well. The IWILL card would only work on the closest location on the IDE cable. The Kouwell card works fine with it connected to the end of the cable. I've got a couple other VLB controllers, but the one seemed to have the same issue as the IWILL one and I was also not able to find the jumper settings. The other card doesn't have the bracket as it came from a scrapper so I didn't even try it. Now to actually finish the build... decide exactly what sound cards I want to have in it and get the config.sys and autoexec.bat menus set up for the different cards as I am pretty sure the cards I will want to have in it will not play nicely together. Pretty sure I will run out of I/O, IRQ, and DMA addresses. Getting ready to get back on the road which means it's time to thin out my retro collection down to what I actually want to keep. Have three Dell OptiPlex machines that I am disassembling and all parts are spoken for. Two Gateway computers which are G6-400s I am parting out since they have nice Gateway branded, Intel manufactured Slot 1 motherboards. Both are in perfect working condition for the price of shipping only. They each have a 128MB RAM stick in them along with an AGP card, sound card and NIC. Both have a PII-400MHz Slot 1 CPU. One has an ATI Rage Pro Turbo AGP card and one has a 32MB TNT2 AGP card. The sound cards are all ESS chip based PCI cards. The NICs are a 3com variety PCI network card. Parted out all the floppy drives and some had an optical drive as well. Also have a Duron 1300 CPU with 512MB RAM on a small motherboard that I have yet to identify. Also have an Athlon 3700+ CPU with HSF. Pulled about 6 working IDE drives from the systems as well and am going to part with a few of them. Some of it will be given away in my hardware giveaway thread and other parts I would like to get shipping costs covered since it will be heavier. Have no interest in profiting on any of it. Just want to get it all good homes. Just PM me if interested. I will not sell or trade these items as stated in the forum rules, but motherboards need good packing so shipping costs covered would be nice on the bigger stuff. I am recycling the Gateway cases since they are heavy and not worth shipping costs plus these are pretty yellowed, scuffed up and nasty. Since my main retro workhorse system is a Gateway case, but with a NOS Socket 370 board I am also parting out the power buttons and power button harnesses from the three Gateway cases since those tend to be a weak spot on the late 90s Gateway cases and break easily over time. Those type of parts are hard to come by on Ebay. Last edited by liqmat on 2018-8-13 @ 14:23, edited 3 times in total. debs3759 wrote: The Thunderbird is... I'll be testing them before the slower models when I get a motherboard and receive the Orion. This is fascinating. I had no idea there was a slot A T-bird. How wide spread was motherboard support for the slot A T-bird? Did it only take a BIOS update to get it going? Any idea what a clock-for-clock comparison is between the slot A T-bird and the slot A Athlon (Orion)? Lastly, were there there Slot A "slockets" to use T-Birds in? 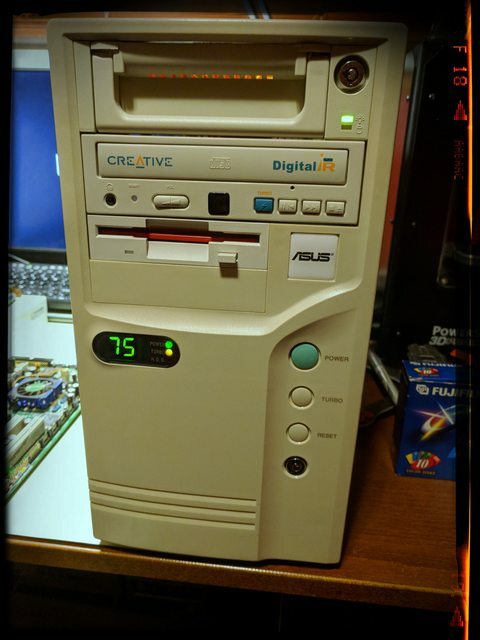 Installed a new CD-ROM in my Pentium 75MHz machine. I was hoping the aqua turbo button would match the power button, but close enough.. Maybe I'll plasti-dip the power button if I can find the right color. Need help soldering/repairing? --> IPC 7711B/7721B Circuit Board Repair Manuals - Step by Step! I have no idea yet if a BIOS update was necessary, but I imagine so. I have never heard of a slotket type adapter for Slot A. There were two common(ish) Slot A chipsets, the AMD750 and the Via KX133. Only the (older, slower) AMD750 supports Thunderboard, KX133 had timing issues and couldn't run the Thunderbird stably. wiretap wrote: Installed a new CD-ROM in my Pentium 75MHz machine. I was hoping the aqua turbo button would match the power button, but close enough.. Maybe I'll plasti-dip the power button if I can find the right color. I am not one to tell anyone what to do with their hardware, but I think it looks outstanding just as it is in its original color scheme. Quirky looks makes it more interesting. liqmat wrote: I am not one to tell anyone what to do with their hardware, but I think it looks outstanding just as it is in its original color scheme. Quirky looks makes it more interesting. Yep if it was me I'd leave that power button alone, very 90's colour that, but I salute your dedication to getting the aesthetics right! Well, I did repair a 22" Samsung monitor, which isn't really retro... and I forgot to take pics as well. Works great after a few new caps. I still need to identify the caps on a souple of SIPP-era motherboards before I swap them out. But I also removed some corroding batteries from old 486 motherboards. Thinking about whether to put a socket for another 3.6V battery in or a header for a alkaline battery pack. The first one was quite clean. The second one was a little dodgy but not terrible. Attended a VCF workshop and got some things fixed and others diagnosed for future repairs. I successfully recapped my TRS-80 Model 4P power supply, save for a few caps I still need to order as I did not have them on hand. On the bright side, the screen no longer shrinks when the disk drives spin up! I am still having an issue with the second disk drive struggling and reading disks slower than the first drive, though. My theory is that the belt is slipping, or the motor is set to spin a little too slowly, but I'll need to dive further into troubleshooting it before I can figure out for sure what the issue is. For now I'm just taking a regular old Teac 360K drive from a PC to use. I like that hard drive pedestal holding up your floppy drives. Use what you have at hand. Nice looking system. liqmat wrote: I like that hard drive pedestal holding up your floppy drives. Use what you have at hand. Nice looking system. Thanks, was wondering if someone would notice. The cable Radio Shack put in there is so short that it's nearly impossible to run them out of the system. Bit broke after the holidays, so focussing on working with what I've got rather than hoarding new stuff. Been cleaning up the spare room workshop a bit and finishing my backlog of soldering. After that it was getting late, but I still had time to finally start on my UMC-build, with UMC CPU, UMC chipset, UMC I/O, UMC VGA and UMC NIC. Didn't get much further than installing the board in my AT desktop case and checking that it worked, but at least that went smoothly. Tonight I choose a HDD and get DOS running.